CCSlider is an unique jQuery slideshow plugin. It supports 3d transitions! There are 14 stunning 3d transitions available, and also 16 stylish 2d transitions. Cute Slider comes with ability to show your slides with awesome 3D & 2D transitions. Cute Slider makes your ideas alive, It gives you what you desire,you can use it as an advanced 2D slider with tons of 2D transitions, or add third dimention to your slider and create a unique and impressive 3D slider. 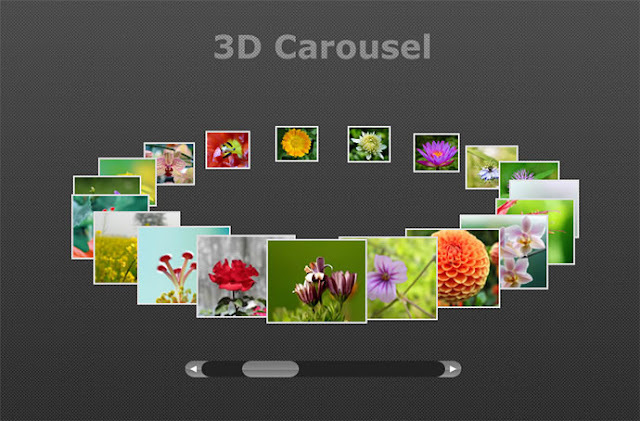 3D Carousel is a powerful jQuery plugin that allows you to arrange a set of images in a carousel layout. Adaptor is a light-weight content slider that aims to provide a simple interface for developers to create cool 2D or 3D slide animation transitions. jQuery Plugin that casts photorealistic shadows. Perfect for eye-catching demos and landing pages.